This antibody reacts specifically with human Otoferlin protein (220 kDa). Tagged fusion protein, corresponding to amino acids 1-395 of Human Otoferlin. Our Abpromise guarantee covers the use of ab53233 in the following tested applications. WB 1/200 - 1/1000. Predicted molecular weight: 227 kDa. Key calcium ion sensor involved in the Ca(2+)-triggered synaptic vesicle-plasma membrane fusion and in the control of neurotransmitter release at these output synapses. Interacts in a calcium-dependent manner to the presynaptic SNARE proteins at ribbon synapses of cochlear inner hair cells (IHCs) to trigger exocytosis of neurotransmitter. Also essential to synaptic exocytosis in immature outer hair cells (OHCs). May also play a role within the recycling of endosomes. Isoform 1 and isoform 3 are found in adult brain. Isoform 2 is expressed in the fetus and in adult brain, heart, placenta, skeletal muscle and kidney. Defects in OTOF are the cause of deafness autosomal recessive type 9 (DFNB9) [MIM:601071]. DFNB9 is a form of sensorineural hearing loss. Sensorineural deafness results from damage to the neural receptors of the inner ear, the nerve pathways to the brain, or the area of the brain that receives sound information. Defects in OTOF are a cause of non-syndromic auditory neuropathy autosomal recessive (NSRAN) [MIM:601071]. NSRAN is a form of sensorineural hearing impairment with absent or severely abnormal auditory brainstem response but normal otoacoustic emissions. Auditory neuropathies result from a lesion in the area including the inner hair cells, connections between the inner hair cells and the cochlear branch of the auditory nerve, the auditory nerve itself and auditory pathways of the brainstem. In some cases NSRAN phenotype can be temperature sensitive. Belongs to the ferlin family. Cytoplasmic vesicle > secretory vesicle > synaptic vesicle membrane. Basolateral cell membrane. Endoplasmic reticulum membrane. Cell membrane. Detected at basolateral cell membrane with synaptic vesicles surrounding the ribbon and at the presynaptic plasma membrane in the inner hair cells (IHCs). Colocalizes with GPR25 and RAB8B in inner hair cells. Overlay histogram showing SHSY-5Y cells stained with ab53233 (red line). The cells were fixed with 4% paraformaldehyde (10 min) and then permeabilized with 0.1% PBS-Tween for 20 min. The cells were then incubated in 1x PBS / 10% normal goat serum / 0.3M glycine to block non-specific protein-protein interactions followed by the antibody (ab53233, 1µg/1x106 cells) for 30 min at 22ºC. The secondary antibody used was DyLight® 488 goat anti-mouse IgG (H+L) (ab96879) at 1/500 dilution for 30 min at 22ºC. Isotype control antibody (black line) was mouse IgG1 [ICIGG1] (ab91353, 2µg/1x106 cells) used under the same conditions. Acquisition of >5,000 events was performed. 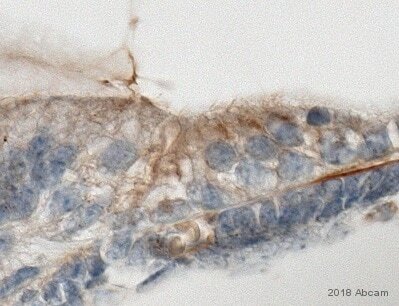 This antibody gave a positive signal in SHSY-5Y cells fixed with 80% methanol (5 min)/permeabilized with 0.1% PBS-Tween for 20 min used under the same conditions. 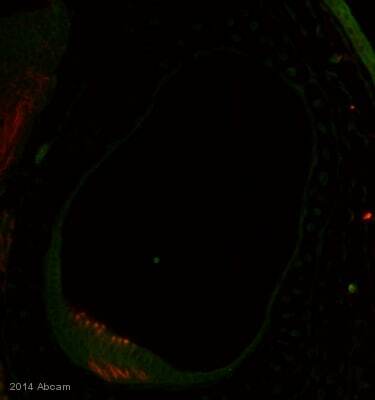 ICC/IF analysis of mouse inner ear tissue labeling Otoferlin with ab181781. At 30 days postnatal, Otoferlin is detected in the hair cells of the crista ampullaris (CA) , utricular macula (UM) and saccularmacula (SM). Publishing research using ab53233? Please let us know so that we can cite the reference in this datasheet.